Here we have a new selection of pre-arranged gifts from The Baby Hamper Company - the twin baby hampers range! After many requests for twins boxes, we have come up with a selection to suit all budgets. 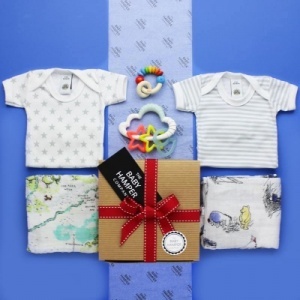 Carefully chosen baby gifts have been included to complement each other and give some really funky outfit combinations, to ensure your newborn little ones will stand out from the crowd. Combine this with newborn essential gifts and some much-needed treats for new mums, you can't go wrong. Our twin baby hampers have been set at budgets to suit all, and with UK express and worldwide delivery available, order yours today!